In 1938 Germany made plans to build six battleships with a displacement of 56.200 tons. Each battleship in this "Plan Z", was to be armed with 4 turrets with each two guns of 40,6 cm. The keels of two ships, "H" and "J", were soon layed down and Krupp was ordered to construct the guns. In the German naval tradition, the names of the ships were not revealed untill the launch. The work at the shipyards was stopped in 1940. Several sources contradict on the number of guns that Krupp has completed. We think that in 1940, at least twelve guns were ready and at stock in Essen. Special designed turrets (mounting C/39) for this gun, were made to enable the use on bunkers in coastal batteries. 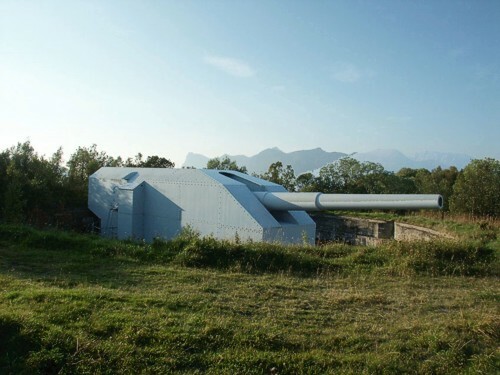 The coastal version of this gun had an other chamber and was called "Adolf". The first three guns were placed in the Baltic area (Danzig) to prevent a Russian attack. 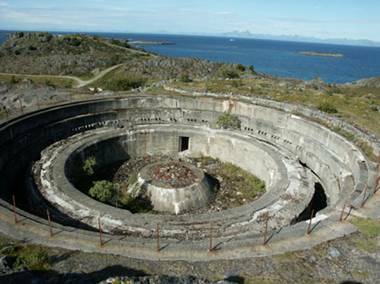 This battery "Schleswig Holstein", was relocated to Calais in 1941. This battery was renamed as "Gross Deutschland", which might give more body to the rumours that the ship "H" would have had this name also. In honor of the captain of the "Bismarck", the battery at Sangatte became more famous under the name battery "Lindemann". The other guns were transported to Narvik, in order to be placed in the batteries "Trondenes I" and "Dietl". That battery had three guns.